March Charity Challenge: I have paired up with The Salvation Army. Last month I started a "10dayswithout" campaign (check it out here) that I am following through with each month. For those of you who thought I was a kidding about this, rest assured, I am not. Why only give during the holidays? Why not help out, where you can, when you can, without always donating money. I don't know about you but I am not made of money. I have found creative ways to help others. I may be only one person, one blog but my actions matter! 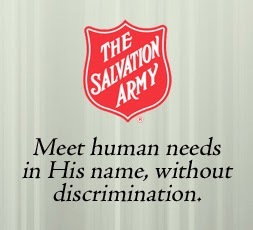 This month I have teamed up with The Salvation Army. I have to say I am running a few days late with this because I have been very ill but we are on track now and ready to do this. Yes, they have a thrift store! But what do they do, who do they help? They currently are meeting the needs of 5,409 people in Jamestown, NY. at Christmas time they supply 3 gifts a child (1,179) a Christmas dinner and sides! Have you seen the word food come up a lot? This is a big problem and not just in third world countries. Yes, you think of people who are hungry, starving and you think of small tiny boned humans. But in your own town a child goes without breakfast, lunch and dinner (breaks my heart). A family has to choose between bills or food several times. Yes, we have assistance BUT assistance doesn't help everyone. What about the folks who work but still don't make ends meat? My challenge this month is to give up the luxury of MONEY. Yes, you read that for 10 days my family of three, will give up my debit card (and coupons EEK) and only use what a typical family has for groceries. I will NOT use coupons because if I did this, I could live happily. However, most are not educated on how to use coupons and some just don't want too. To keep things fair I wanted to recreate what it is like for those who live without and see if I can make it on this strict budget. I will NOT put my family in danger nor go hungry, I just want to show that for some who go hungry it is not because "they did this" or they aren't trying". Some may need a little help or education. How did I decide our budget? I used the School lunch system as a reference. Why? Because many children go without lunches due to money so I thought it only fair to show this too. School lunches on average are about $2.63 (for a healthy meal, HAHAHA, someone should look into this, I can't buy a bag of apples for that much!). For this month we will live on this meal budget. $2.63 a meal, for 10 days. That averages to be around $78.90 for 10 days. Is this doable in this day and age? Remember they are serving OUR hungry community. This is in our hometown not some far off land. So during my 10 days we will collect these items (email me). You can also drop them off to 83 South Main Street, Jamestown NY 14701. You are very inspirational Liz!! What an awesome idea. And it's a great way to remember just how much we have in life while sharing with others.